I took up some Japanese language classes earlier this year and managed to pickup some important Japanese phrases, for instance how to ask a girl or guy but most preferably a girl for her phone number and how to say “your welcome” (allows u to stun a Singaporean waiter who says “Arigato” to you as you are leaving a Japanese Restaurant). Anyway, Aoki means “Blue Tree” in Japanese according to answers.com, so it’s odd why the chinese words say “Green Tree”. There are 3 scripts in the Japanese language, Hiragana, Katakana and Kanji(looks like Chinese Characters). So perhaps in Kanji, that actually means “Blue Tree” but that’s just my guess. 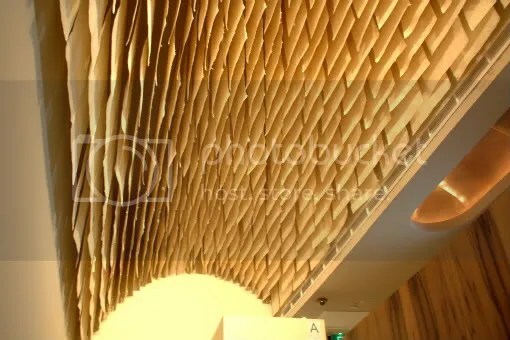 From Aoki’s layout and ambience, you would hardly guess that this is a fine dining establishment. 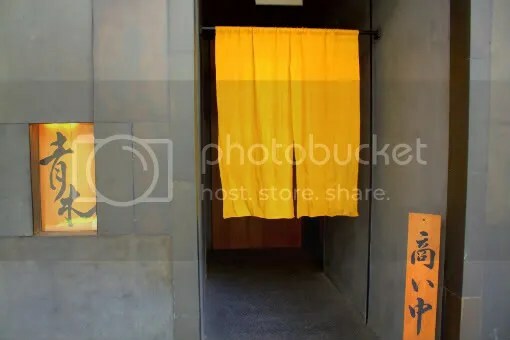 The entrance to the restaurant is inconspicuous and unassuming, looking somewhat like an entrance to a lavatory or kitchen, but don’t be fooled. Gastronomic pleasures lie within. If you make reservations which you should (my last attempt as a walk-in customer failed), opt for counter seats. 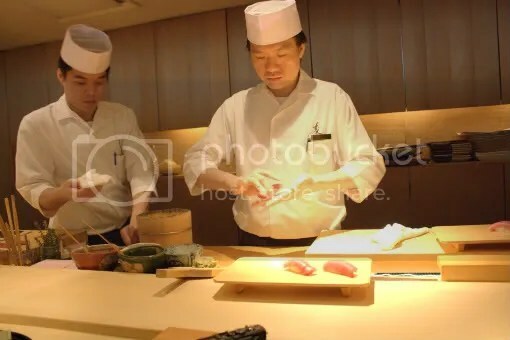 You will get to see the master chefs at work, dexterously and adroitly moulding sushi and cutting sashimi. Once in a while, you even get to see some pyrotechnics! Ok, pyrotechnics is just a euphemism for searing but the use of a blow torch still fascinates most nonetheless. 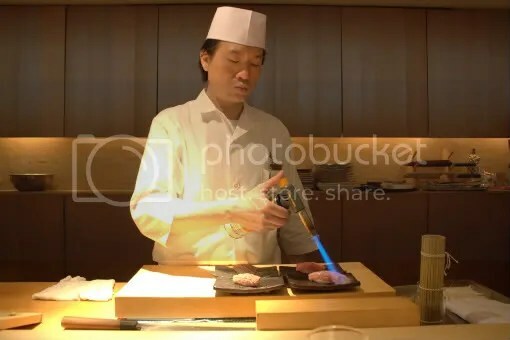 I was right in front of the action as the chef masterfully seared the pieces of Tuna Belly Sushi. Omg, as you witness the fats of the tuna belly starting to bubble and sizzle, you just lament at how eating an Omakase Lunch Set($100++) is totally out of your budget. There’s a $3++ charge for Otoshi. 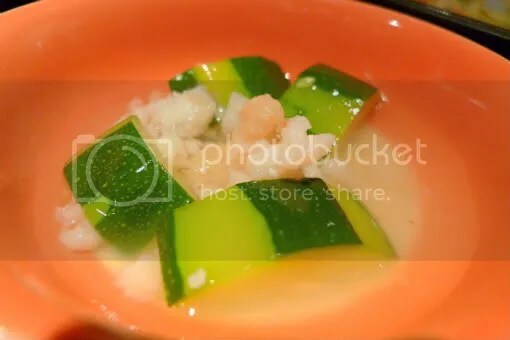 Typically, it’s a starter that is served alongside when one orders an alcoholic beverage. For Aoki, this is instilled as a cover charge, probably for the tea and oshibori(hot towels) that are provided before and after the meal, in addition to the dish of Cold Spinach. The hot towels reminded me of the ones you would get on an airplane, and in this scenario, our destination would be gastronomic paradise. For lunch, do order the sets instead of ala-carte because it is definitely of more value. I ordered the Mazechirashi($35++) which also comes with Salad, Miso Soup, Pickles and a trio of Desserts. The Chirashi served here is really orgasmic. A variety of Sashimi, ranging from Tuna (Maguro), Tuna Belly (Chutoro rather than Ootoro though), Uni (Sea Urchin), Hotate (Scallop), Ikura (Salmon Roe), Ika (Squid), Ebi (Shrimp), Tamago (Sweet Egg), and I think there might have been Aji (Skip Jack) and Tai (Sea Bream) as well. I’m usually not a fan of Tuna, because I find that it carries a distinctive metallic taste (maybe from the blood) which I don’t really fancy, plus Maguro is too lean compared to Salmon Sashimi. However, the Tuna in this Chirashi is different somehow. Very palatable and fresh and there was no metallic taste, plus it was fatty as well! 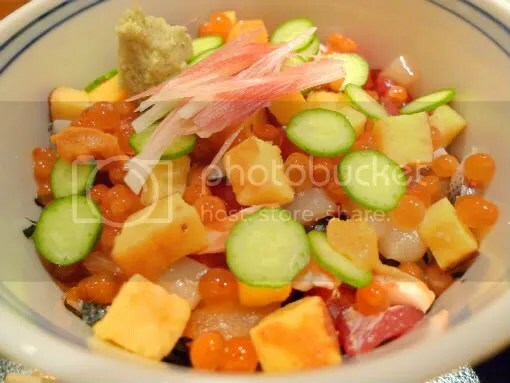 Each time your chopsticks dive into this treasure trove of a chirashi, you never know what you are going to get and this keeps one in suspense and silent anticipation throughout the meal. Anyway, I prefer to eat my Uni by itself to enjoy the full extent of each small piece rather than mixing it with rice where its taste becomes indiscernible. 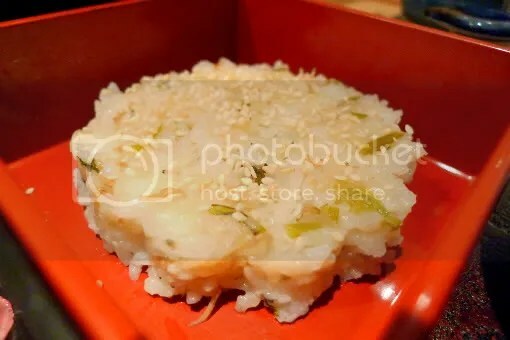 One special feature about Aoki is that they provide hon-Wasabi, meaning Wasabi that is freshly grated compared to most eateries that provide Wasabi sold in commercial tubes or made from Wasabi powder. Since I’m not a true wasabi lover, the difference to me was that hon-wasabi has a milder tone compared to the tubed wasabi which has other ingredients such as mustard inside as well while S felt that the hon-wasabi had a fruitier flavour compared to the tubed wasabi. 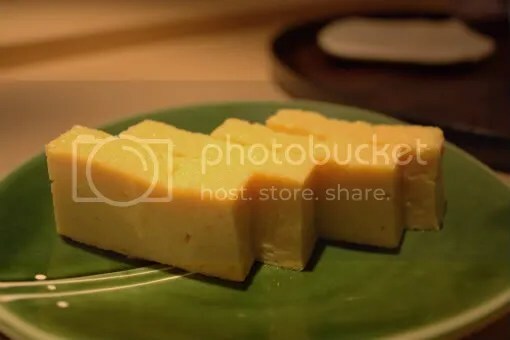 If you find the Tamago good, you can buy it as a side for $6++ as well which is just what I did. Nothing too fancy about the Salad. Just one with a light vinaigrette dressing. 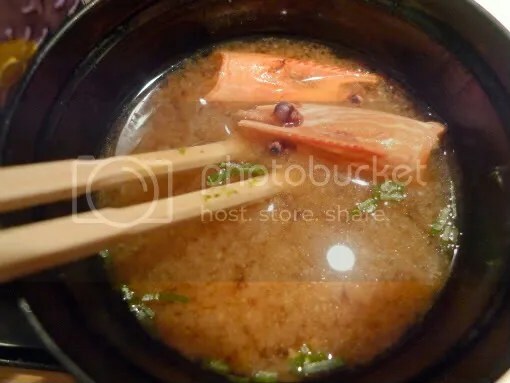 The Miso Soup here is especially flavourful because it is simmered with prawn heads and it really make the soup richer and sweeter. 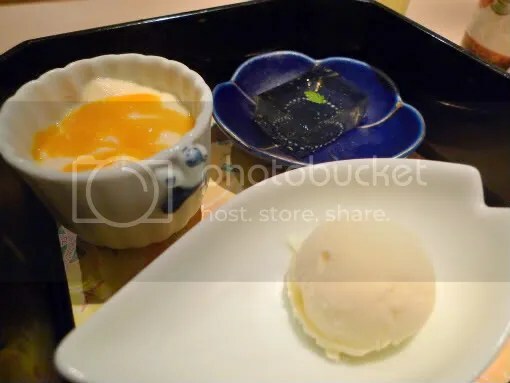 The Trio of Desserts comprised of a slab of White Wine Jelly, a Scoop of Milk Ice Cream and a Cup of Custard with Mango Sauce. It’s really hard for me to choose a favourite dessert because they are all just soooooo good. I’m really impressed. The last time I had liquor in a jelly was at a friend’s birthday party where half of the agar agar was made from vodka instead of water and I felt that this White Wine Jelly was really innovative. The thing I love about these desserts is that they are all pleasantly light and sweet, and wasn’t heavy or cloying enough to make me feel like downing litres of tea or water after being already stuffed to the brim. 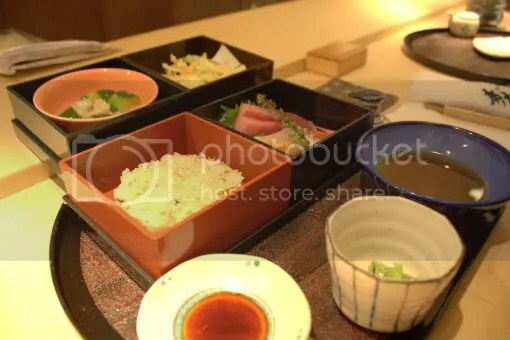 For the Shokado($38++), you get Sashimi, Nimono(Steamed Vegetables), Tempura, Miso Soup, Rice and the same trio of Desserts as in the Mazechirashi. 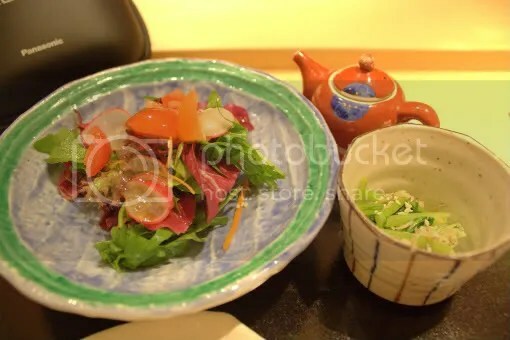 This was what S ordered and I didn’t want to deprive him of his yumyums, (I was too engrossed in my chirashi anyway). Sashimi looks good. Quite a variety there, there was a clam I could not identify in the left foreground. Damn you Aoki! Where else am I going to eat Japanese food without feeling unsatisfied now? Ok we shall answer this question sometime soon after paying a visit to Tatsuya @ Goodwood Park Hotel. But I shall make this official, Aoki is currently my favourite Jap restaurant in Singapore. 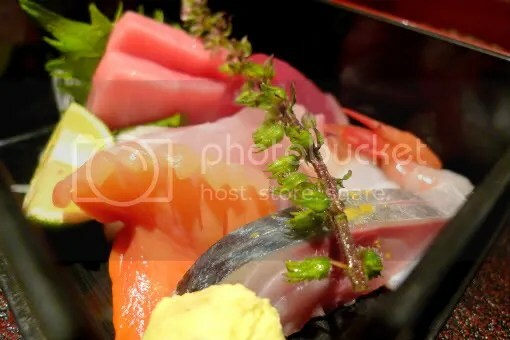 You make me want to head down to Aoki for the Mazechirashi tml! Oh man. I’ve heard so much good things about it! yes u totally should! but the seating capacity is so limited though so i made my reservations like 5 days in advance! icic thx for the info! 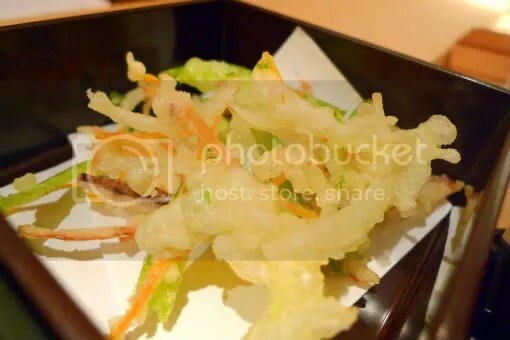 Chanced upon your blog (ok, I’m slow) as my husband and I were searching for reviews on Aoki. A word of ‘thanks’ to your stylish website; easy on the eye with its clean layout, unpretentious colour scheme, nice font and your elegant writing. We are now fans. All good thoughts.